Everything means something, but they don’t always mean the same thing. Westerns are a nostalgic look back at a time of independence and exploration. They’re also about the subjugation of native peoples and a time of almost complete anarchy. Science fiction can be a hopeful look to the years ahead, and it can also be a reflection of our anxieties about the present. Most folks tend to read superheroes as adolescent power fantasies. We want to have the brains of Iron Man, the raw power of the Hulk, the morality of Captain America. That’s why it’s easy to understand a couple of Jewish kids in 1938 creating Superman, a character with the raw power to stand up to Nazis abroad and anti-Semites at home. So where does that leave Ant-Man? When we talk about superheroes, we often identify them based on powers or skills. Batman is the World’s Greatest Detective. The Flash is the Fastest Man Alive. Doctor Strange is the Sorcerer Supreme. Pretty easy to understand why fans gravitate to them, right? But what about a guy with the power to get small? It’s all in the personality. In late June of 2015, Marvel Studios released Ant-Man. This was a smart move, since Avengers: Age of Ultron had been released a month earlier. It had a huge plot, globetrotting action, and end of the world stakes. 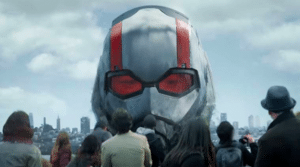 Ant-Man, on the other hand, was a light heist romp about an ex-con lucking into size-changing technology and trying to balance being a good dad with being a competent superhero. 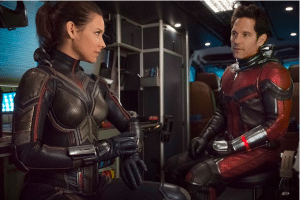 It was a palate cleanser, and now, with Ant-Man and the Wasp following up Avengers: Infinity War, Marvel Studios does it again. On the one hand, consider Scott Lang (Paul Rudd). After the events of Captain America: Civil War, what did Scott get for teaming up with a bunch of Avengers and wrecking a German airport? He got two years of house arrest. It’s not all bad, since he gets visitation from his 10 year-old daughter Cassie (Abby Ryder Fortson). Better yet, he has a solidly good relationship with his ex-wife Maggie (Judy Greer) and her cop husband Paxton (Bobby Cannavale). Even better yet, in three days he’ll be finished with his sentence. While Scott’s been hanging at home, Hope and Pym have been a little more ambitious. Decades earlier, Pym was on a mission with his wife, Janet van Dyne (Michelle Pfeiffer). To prevent a nuclear explosion, Janet shrunk down between the molecules of a nuclear missile and disabled it. Unfortunately, going that itty-bitty trapped her in the subatomic quantum realm. Pym thinks he knows how to rescue her. He’ll create a quantum tunnel, which allows him to zero in on Janet’s location. While it sounds laughably easy, there’s a critically important part he needs. Hope knows a guy. That guy is Sonny Burch (Walton Goggins), a black market dealer. Sonny will sell Hope the part, if she agrees to cut him in on Pym’s tech. 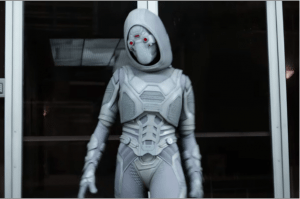 Things get complicated when the Ghost (Hannah John-Kamen), a supervillain with phasing abilities, sets her sights on the part as well. Naturally, things get even more complicated with the fact that Janet has somehow created a quantum bond between herself and Scott. There’s also FBI agent Jimmy Woo (Randall Park), who’s sure Scott is up to something fishy, and Scott’s goofball buddies Luis (Michael Pena), Dave (T.I.) and Kurt (David Dastmalchian), who want him to help get their security company off the ground. If movies are meals, we’ve gotten three distinct offerings from the MCU this year. Black Panther is an elegant dinner filled with bold and creative tastes. Avengers: Infinity War is a sumptuous banquet crammed onto a groaning dinner table. Ant-Man and the Wasp is a raspberry sherbet on a hot summer day, designed to be light and refreshing. This is good, considering the sizable gut punch we were left with at the end of Avengers: Infinity War. When Ant-Man was released, my friend Keith was absolutely baffled by the concept of the hero. “You mean he shrinks? That’s all?” It might not sound like much. Creativity is the name of the game here, and director Peyton Reed takes a simple idea, stuff getting smaller or bigger, and runs with it. There are a host of fun ideas at play here, everything from expanding salt shakers to a fleet of miniaturized vehicles. On top of that, Reed’s direction is breezy, charming, and fast-paced. He also genuinely likes his characters, and while you’d think a screenplay with five credited screenwriters would transform into an unholy mess, that’s thankfully not the case. Family is a running theme, and nearly all the characters are trying to either hold onto their loved ones or be a part of a family. Ant-Man and the Wasp ties Thor: Ragnarok as possibly the funniest movie in the Marvel Cinematic Universe. The plot points aren’t always resolved in the most clever ways possible. Given the consistent sense of fun, though, this was never a deal breaker for me. If there’s one thing Marvel Studios does better than any other studio in town, it’s smart casting. Paul Rudd’s good-natured screwup Scott is a great counterpoint to the more dramatic heroes of the MCU like Thor. Evangeline Lilly as the Wasp is great fun. She’s smart, sardonic, and her action sequences are cool as hell. The great Laurence Fishburne appears as one of Pym’s ex-colleagues with secrets of his own. In a movie filled with scene stealers, it’s hard for me to decide who really walked away with the movie. In the end, it comes down to either Michael Pena as the charming motormouth Luis or Randall Park as neurotic Agent Woo. So what does Ant-Man and the Wasp mean? It’s about the triumph of the little guy. This franchise about size-altering heroes has staked out a distinctive and weird little corner in the larger tapestry of the MCU. It has nothing to do with being the biggest or the best. 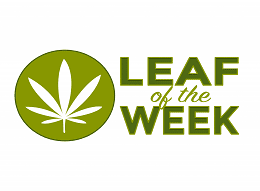 Rather, it’s content to do its own thing with good humor and charm. 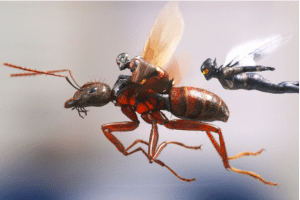 *For some of the more literal-minded out there, the “science” of Ant-Man gives them the vapors. What happens to the weight of shrunk objects? When a building becomes itty-bitty, what keeps everything inside upright? If you’ve got any theories explaining this, please share ‘em here. Extra points for creativity, and responses consisting of, “It’s just a movie” will result in shunning.